Often, people assume that eating gluten-free equals eating healthy. It’s true that you usually cut down on processed and packaged foods, but it’s also true that you can still eat just as much sugar and fat and just as many empty calories as when you could eat whatever you wanted. Often, especially at the beginning of the gluten-free journey, it’s easy to eat anything that is safe, without regard to nutrition. Feelings of deprivation are common, so it’s easy to fill those gaps with special treats or sweets. It’s especially important to pay attention to nutrition though, especially as you begin the journey toward healing. Healthy fats from olive oil, flaxseed oils and nuts, whole grains like brown rice and quinoa, and lots of fruits and veggies provide lots of nutrition to heal, while a lot of the white flours have been stripped of these important nutrients. 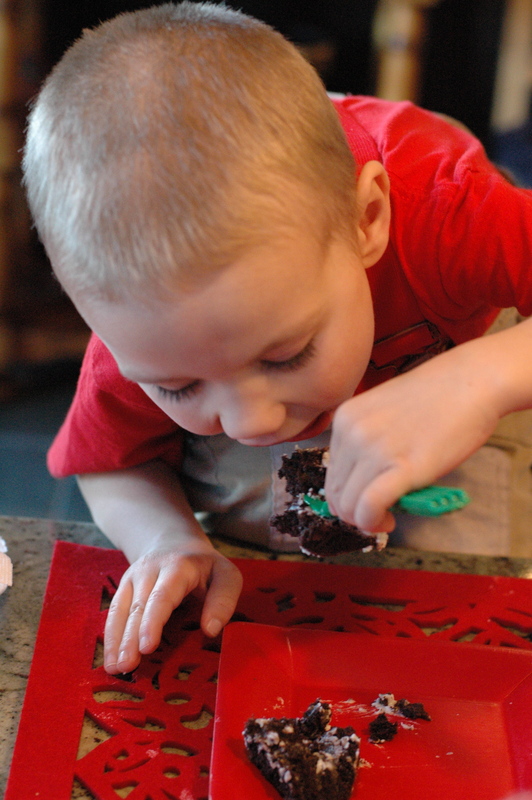 Gluten-Free baked treats are especially likely to come from processed flours which have little nutrition and no fiber. Sometimes this is OK, but for everyday meals, I’ve been searching for healthier whole food goodies. 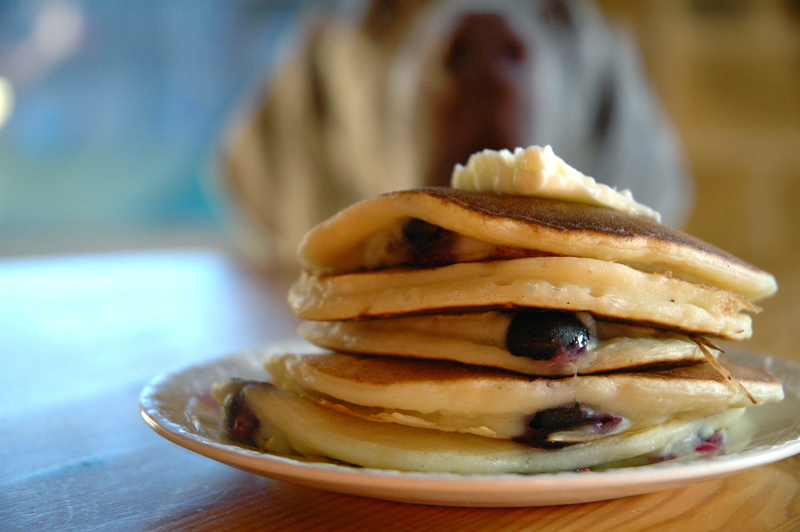 Recently, I’ve begun to experiment with recipes that use almond flour, coconut flour, grapeseed oil, and agave nectar, using recipes from elanaspantry.com. She has recipes on her site, and a cookbook, which explains why she uses these ingredients to produce healthier, more nutritious, lower glycemic foods. 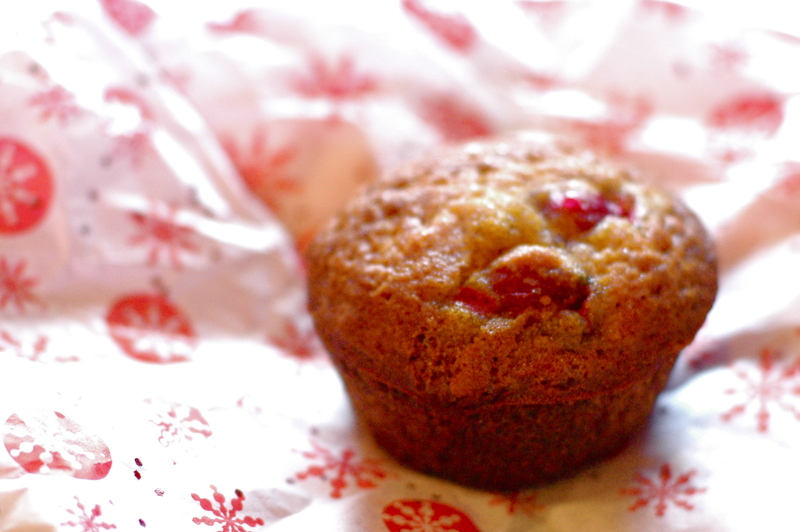 I made her Cranberry Walnut Muffins for Christmas morning, and they were wonderful. They were super simple to make, and they tasted healthy and whole while also being very yummy. I made them as 12 muffins, instead of bread, and calculated the nutritional value per muffin, mostly for my neighbor friend who needs to know these specifics to serve them to her diabetic daughter. I think these recipes look very promising for her. 🙂 Each one has 16g. of carbs, 4 g. protein, 15 g. of fat, and 209 calories, plus lots of nutrition from cranberries, walnuts, grapeseed oil, and almond flour. I’m loving these ingredients and looking forward to trying many more of Elana’s recipes. And, it seems I will get to try these muffins again very soon, because my dog just got up on the counter and ate 8 of the 12 muffins. 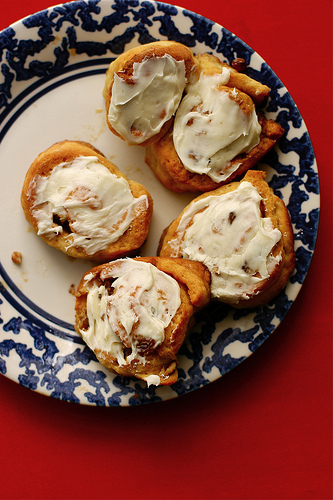 We’ll be making these lovely Cinnamon Rolls today, created by the Gluten Free Girl, to have Christmas morning. 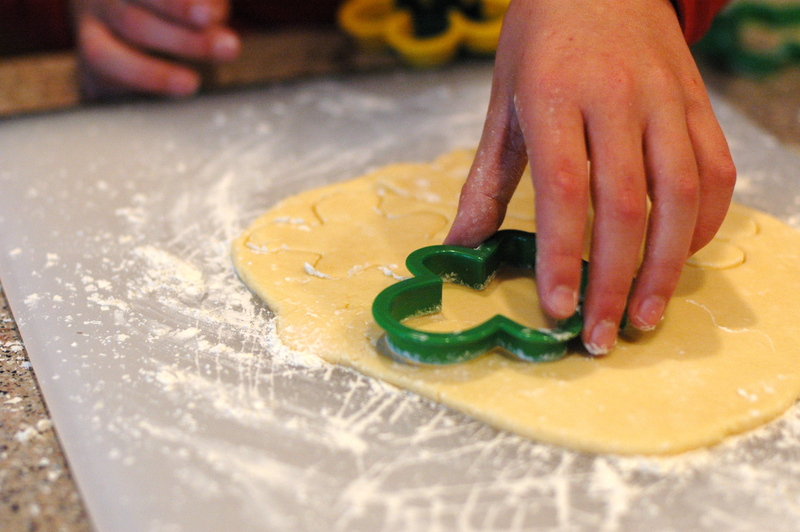 It’s a family tradition from the boys’ Great-Grandmother Neenie that we’ll enjoy for the first time this year since going gluten-free. Thanks, Shauna! You’ve given us a heartwarming treat to enjoy tomorrow, and you’re baking passion would make Neenie proud! You can find Shauna’s recipe here. 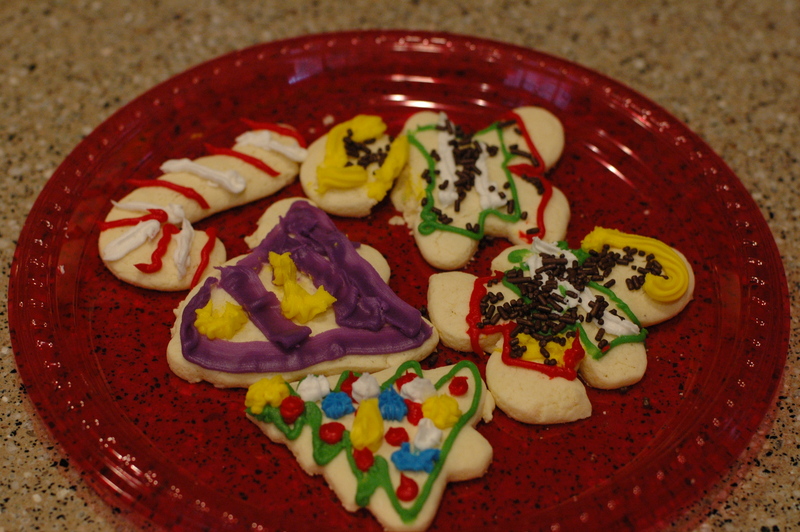 Making Christmas Cookies is one of our favorite traditions, and we always share the creativity with my Mom. 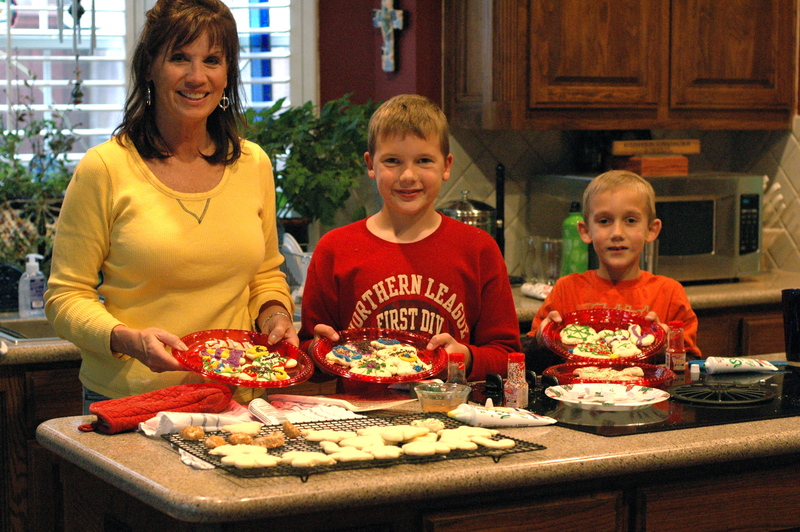 The boys love each part of it: rolling out the dough, pressing the cookie cutters into it, and of course, adding icing and sprinkles. We used the recipe from Jules Gluten Free and had great results. I doubled it, making all the cookies but only icing a few. The rest I’ll put into the freezer to pull out a little at a time so we can have fresh cookies throughout the month. I put the icing in individual baggies with about 1/2 C. in each baggie to pull out of the freezer at the same time. You can find Jules’ recipe below for the cookies. For the icing, I just use the recipe on the powdered sugar box. Cream shortening, sugar and oil several minutes with an electric mixer, until very fluffy. Add egg yolks, vanilla extract and food coloring. 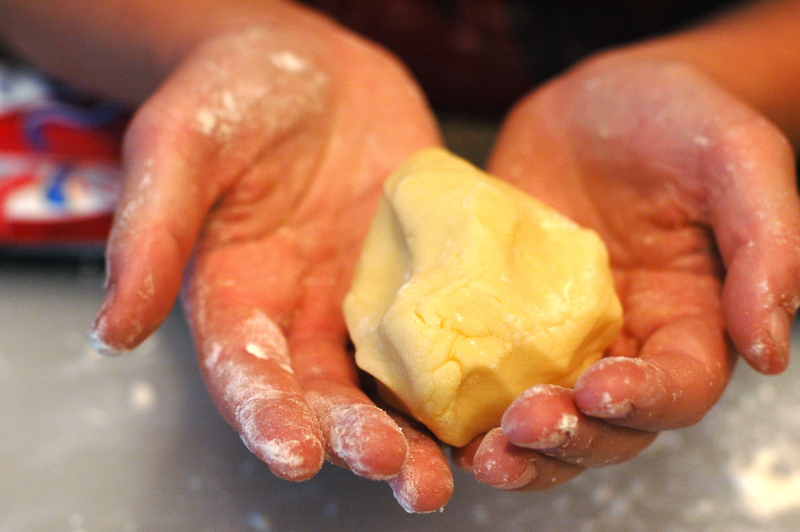 Mix in the dry ingredients, adding in tablespoons of water only as needed to keep the dough together and avoid dryness (err on the side of this dough being wetter so that after refrigeration, it’s not too dry). Pat the dough into a disc shape, cover tightly with plastic wrap and refrigerate the dough until very cold, at least 3-5 hours (overnight is best). Lightly flour a clean rolling surface with Jules Gluten Free™ All Purpose Flour. 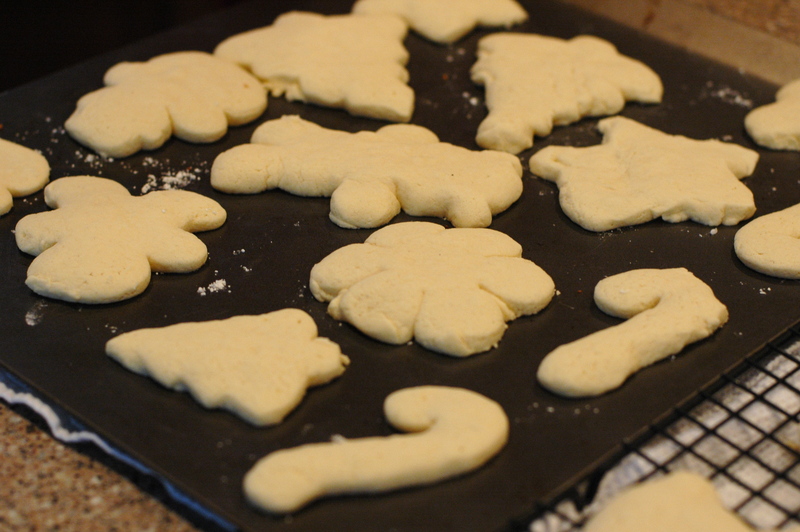 Roll the dough to approximately 1/8 inch thickness and dust cookie cutters with flour before using to cut out shapes. 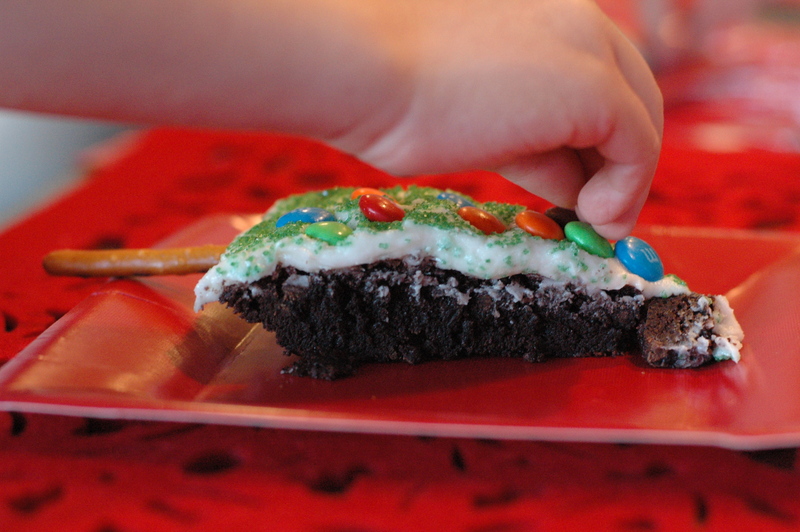 You may also roll thin coils of dough of different colors and braid into candy cane or other fun shapes. 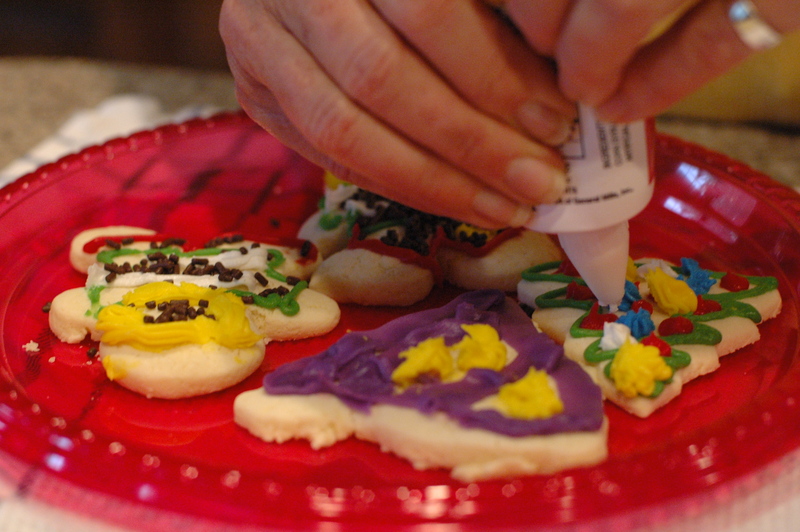 Place cookies onto parchment-lined cookie sheets and decorate with colored sugar, if desired. Bake approximately 8-10 minutes, or until they begin to lightly brown at the edges. 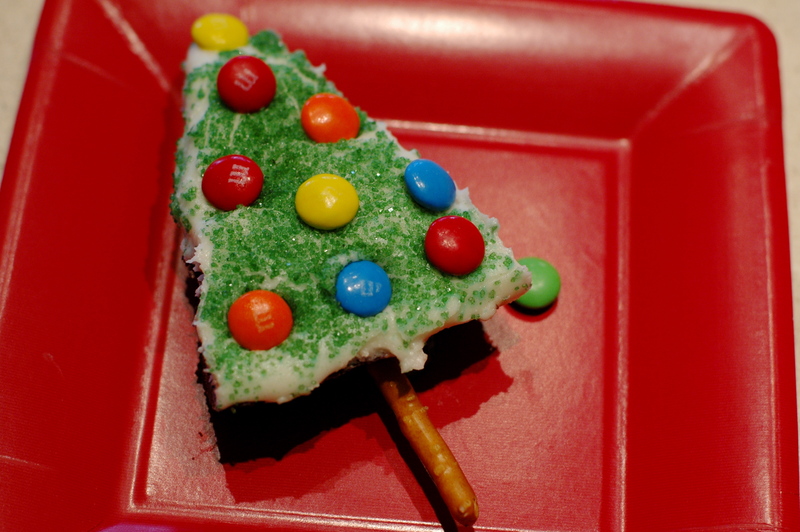 Cool on a cooling rack and frost with gluten-free frosting, if desired. Traveling takes a little more forethought and planning when you’re eating gluten-free. You can’t just stop at any old restaurant along the way or even assume that there will a place to eat in the airport. There are many places that will work, but just in case, I always keep a good stash of food with us. In fact, having safe food at hand is so important that I pack food before clothes, because we all know that it’s never good to see Mommy the kids in a full-blown hunger melt down. 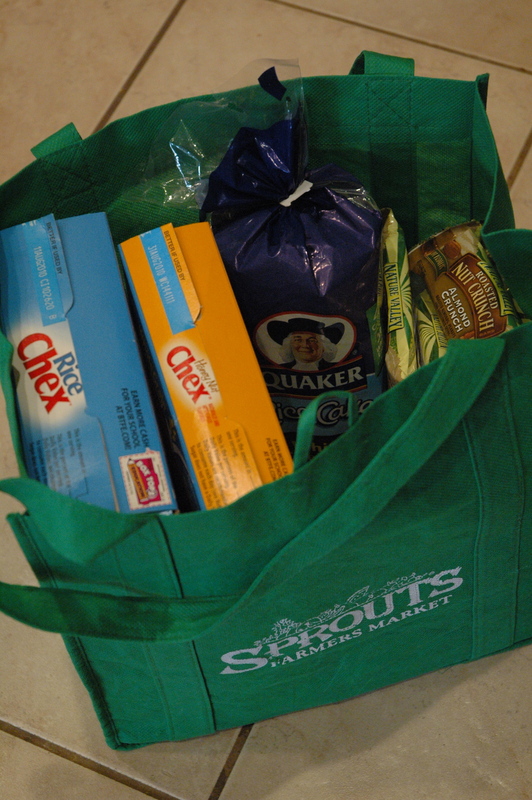 It’s helpful to carry along food that can pack and keep well. For car rides, I pack lots of apples, Nature Valley Almond Crunch bars, several types of trail mix, cheddar rice cakes with Laughing Cow Swiss Cheese Spread (and plastic knives), chocolate rice cakes with a jar of peanut butter, and Honey Rice Chex. For plane trips, I bring an entire food carry-on with Almond Crunch bars, apples, rice cakes, a package of Hormel Naturals deli meat packed inside a large Ziploc bag with an ice pack in it, and trail mix. Be careful of anything “liquid”. This includes peanut butter in a jar, and I know from experience that airport security has no sympathy for under-privileged gluten-free eaters. 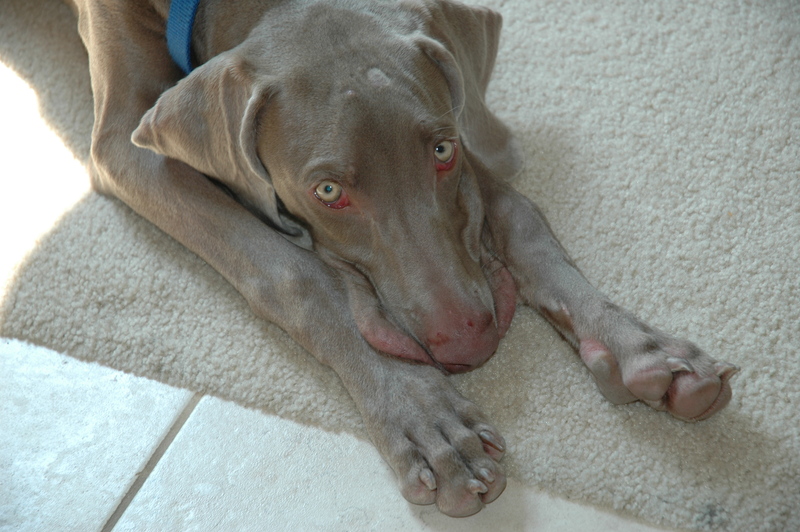 They’ll take that peanut butter right out of your bag, no matter how much you beg. Usually you can find fruit and Lay’s chips in an airport if you need it too. And, most hamburger places can accomodate you if needed. I plan enough food to last us the trip, then if we do find a restaurant where we can eat, it’s a bonus. If not, we’re still set. If we’re in the car, I’ll even pack food for our stay. We traveled 5 hours away a few weeks ago to visit friends for 2 days, and I had more food sacks than suitcases. If we’re flying somewhere, I visit the grocery store once we get there to stock up. You can buy a cooler there, fill it up, and eat most meals that way. We’ve even brought an electric skillet and a crock pot with us to cook in hotel rooms, and most rooms have microwaves now. That means you could eat cereal, microwave eggs, or gluten-free oatmeal for breakfast. Lunch could be microwave quesadillas or rice cakes with meat and cheese, chips and fruit. And dinner could be your restaurant meals. Dinner could also be canned chili with Fritos, quesadillas, Taco Salad with canned beans, or Baked Potatoes. Even though it seems daunting, planning is the key. 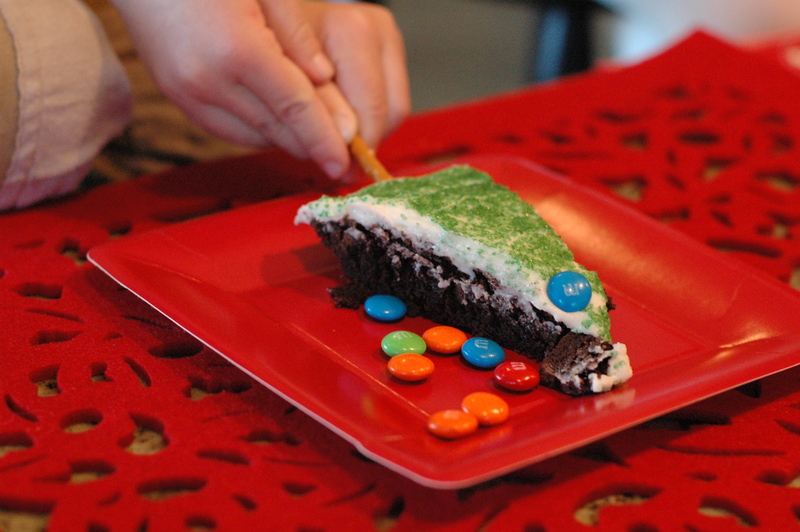 You just have to get used to putting food into your agenda. And, you have to prepare yourself to be a traveling grocery store, which means you may need an extra suitcase just for food. In the end though, it’s cheaper than eating out, usually healthier anyway, and much more peaceful knowing you’re prepared. 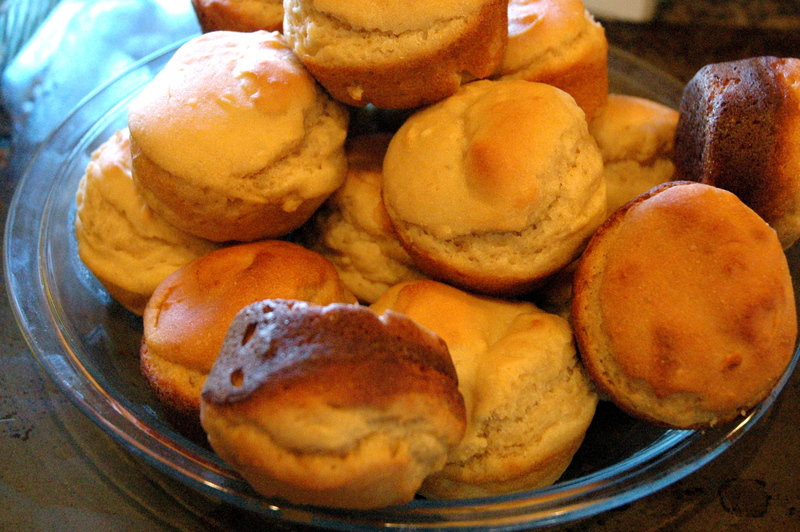 Before going gluten-free, I had 2 ways to make warm, delicious dinner rolls for a special meal. One was to go the homemade route, mixing up dough, letting it rise, mixing again and again, until the beauties were ready a few hours later. The other was to open the freezer door at the grocery store, put the package in my cart, and run home to pop them in the oven and throw away the package so everyone would think I did it by scratch. These gluten-free rolls are a happy medium between those two. If you start with a great bread mix, you can mix up the dough as instructed, then put them right in muffin tins to rise. If you fill the tins up 2/3 full and let them rise to the top (usually 30 minutes), you can put them right into the oven. Be careful on cooking times; mine just took 12 minutes. When they come out, you’ll have yummy, hot rolls that are so worth the effort! My favorite mix to use is Bob’s Red Mill’s “Homemade Wonderful Bread Mix”. You can find it here. I’ve also used my favorite bread recipe from Bette Hagman’s book, “The Gluten-free Gourmet Cooks Fast and Healthy”, which gives a browner roll. As always, make as many as you can with the mix, or even do 2 mixes at once. You can freeze them and pull out as many as you need. You can also use them for sandwich rolls, breakfast sandwiches, or mini hamburger buns. I’ve even brought my own to restaurants to eat with my meal. Don’t be dinner roll deprived any longer! Enjoy! 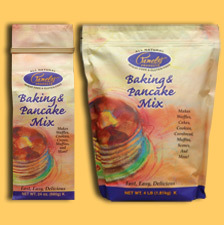 My favorite gluten-free pancakes are from a mix by Pamela’s, appropriately called “Baking and Pancake Mix”. They’re nice and fluffy and have great taste and texture.